Our unholy sermon returns to the capital on May 11th 2018. 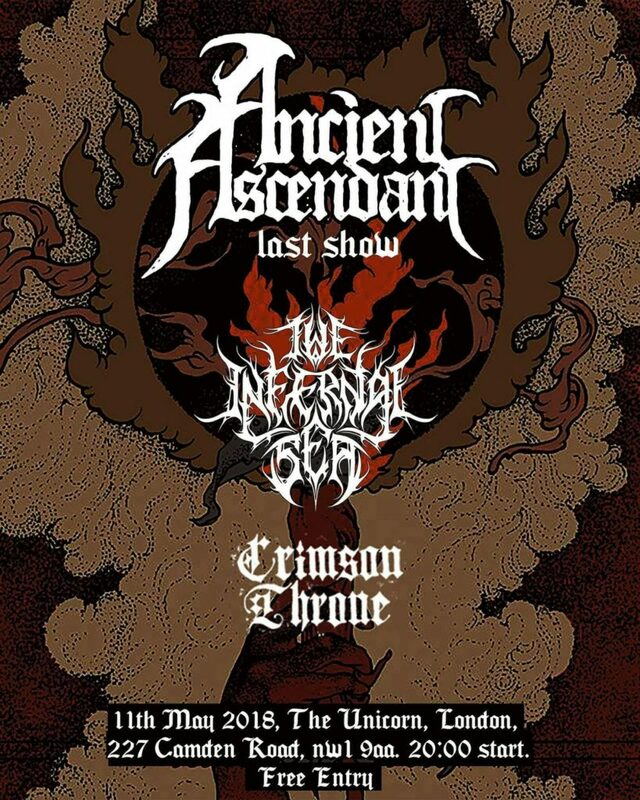 We are honoured to be invited to perform alongside Ancient Ascendant on this their ‘Farewell’ show. We first encountered Ancient Ascendents assault way back in 2011 when we opened for 1349 (Official) at the Underworld. This was our fourth live show and the first in London, the guys welcomed us into the fold and have supported us throughout our career. Our paths crossed many times over the years and it will be a shame to see them ‘retire’ the band. This is going to be one show you will not want to miss and a rare appearance for us. We have decided to perform a ‘Old School’ set comprising of material from ‘Call of the Augur’, ‘The Crypt Sessions’ and other material from our back catalogue. The set will feature songs that we have not played live in over 5 years. Crimson Throne also join the bill completing the line up. Come join the ritual and hail the darkness!